Cross posted from Doomworld, as I thought it would be appropriate to post it on this forum as well. I'm working on a source port called CatacombGL, which aims to offer improved visuals for the Catacomb 3D games. The current version only supports the Catacomb Abyss. Updated 2019-03-31: version 0.2.0 released with support for the Catacomb Armageddon! * Runs native on Windows 7/8/10. * Hardware accelerated 3D rendering via OpenGL, supporting widescreen resolutions, a customizable field of view and an uncapped frame rate. * Player, projectile and monster movement with floating point precision. 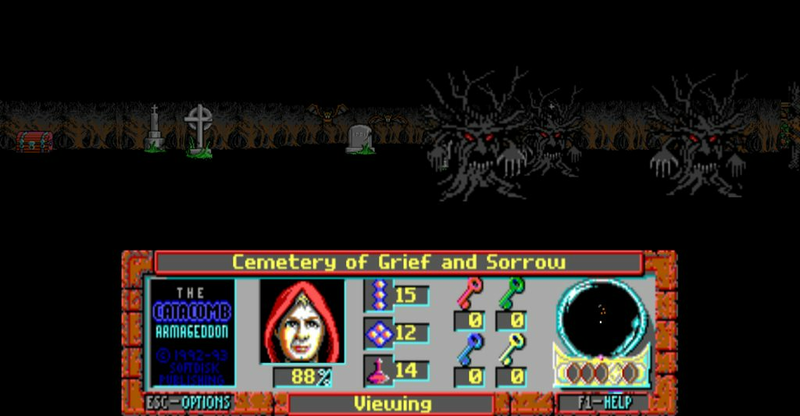 * Supports The Catacomb Abyss version 1.13 (shareware) and version 1.24 (as included in the Catacombs Pack from gog.com). * Supports The Catacomb Armageddon version 1.02 (as included in the Catacombs Pack from gog.com). * Supports WASD and mouselook. * No support for game controllers. * No backwards compatibility with saved games from the original DOS game. * Only Adlib sound card emulation; no PC speaker emulation. 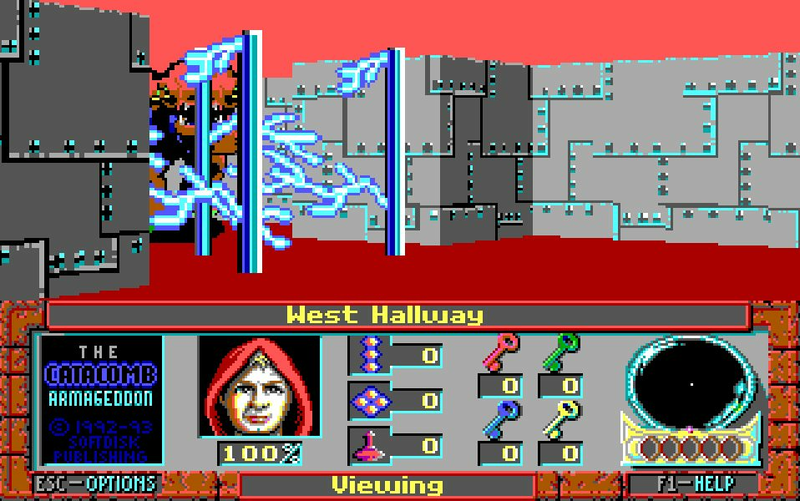 * No "demo" functionality (preview slideshow of Catacomb Armageddon and Apocalypse in shareware version). * No fade-in effect when entering a level. CatacombGL does not run standalone, but requires the original game data (levels, pictures, sounds, etc) to be present on the system. 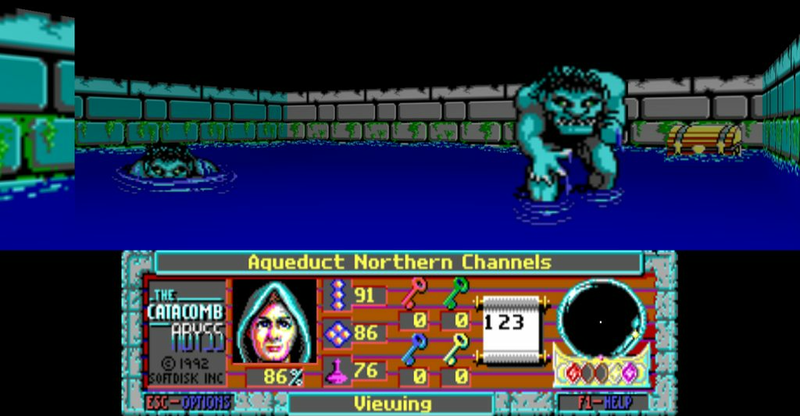 The Catacomb Abyss game data can be obtained legitimately and free-of-charge by downloading the 1.13 shareware version. Various websites offer the shareware version for download, see for example archive.org. Alternatively, the game data can also be obtained by buying the Catacombs Pack from gog.com. The differences between the shareware and commercial versions are purely cosmetic. The Catacombs Pack is required in order to run The Catacomb Armageddon. The CatacombGL.exe can be run from any location. When started, a selection screen with an overview of all the supported games is shown. In case the Catacombs Pack was installed via the GOG installer, the game data will be auto-detected. 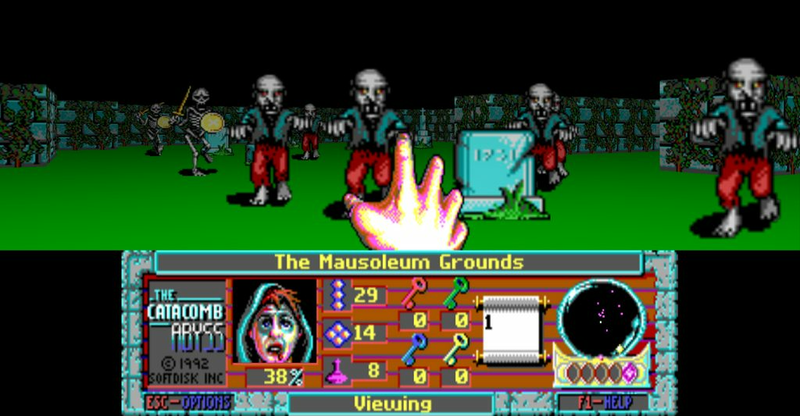 Otherwise, it is possible to manually browse to the folder which contains either the Catacombs Pack or the shareware version. If anyone experiences any issues or if there are suggestions for improvement, please let me know! For people that do not care for widescreen support, texture filtering and OpenGL-style lighting: it is possible to switch that all off to get a more authentic look. Really cool. Will give a try in the near future. Keep the good work. Just tried it, this is amazing, really, guys, you should all try. I will. I've just started working on support for the Catacomb Armageddon. It will take a considerable amount of time to get that done, though. I will keep you posted on the progress. I always thought it was obvious to make the mouse turning speed customizable, but up until now I never considered the keyboard turning speed. Currently it just mimicks the turning speed from the original game, which is 1 degree per gametic. Since the game ran at 60 tics/sec, it takes 3 seconds to do a full 180 degree turn. That's indeed slow. Just like in the original game there's also a quickturn available (TAB or V by default), which gives you 3 degrees per gametic. But that's a two-button approach. I wouldn't mind adding the ability to customize the keyboard turning speed to your preference. Now *this* is how the DOS version should've ran from the very beginning! You'll notice that the framerate in the DOS version is capped at a fairly low number. Even on high-end machines, the game hacked around incessantly, making it harder to aim your fireballs at enemies from a distance. 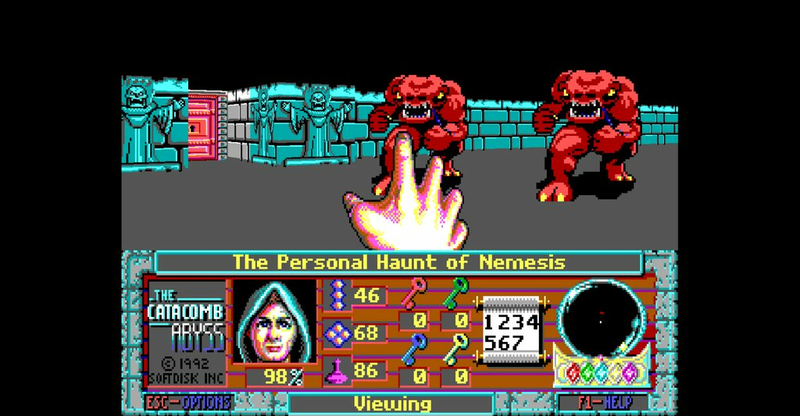 That put you in a really bad spot when the enemies started to bombard you, and you had no Run button to make your man back away faster. I'm extremely happy to see this technicality fixed in the GL version. But that's a two-button approach. I wouldn't mind adding the ability to customize the keyboard turning speed to your preference. I don't use mouse for old shooters, so configurable turning speed would be great. No other big issues so far. As I didn't play much Catacomb...ever probably, F1 help to work would be great. I'm surprised how cool this game is, with its setting and creative features, enemy design...much fun. Not even in Doom ? You will be shocked, but no. I use vertical auto aim, like it was in classic Doom. I used mouse in more modern shooters, like Unreal Tournament, and for those games it was fun. I used mouse in more modern shooters, like Unreal Tournament, and for those games it was fun enough. I play using mouse, but not with free look. I tried to play only with keyboard (like i played when I was a child) but nowaday it is to clunky for me. And my right hand starts to feel pain after like 30 min playing . But yeah, you have my respect. That's my method in Doom as well. Same goes for Heretic and Hexen. I play using mouse, but not with free look. Then how you shoot enemies too high for your view??? The vertical auto-aim still applies by default. With freelook (unlike mouse turn) you don't have vertical auto aim...obviously, as you aim directly with the mouse (including up/down). Depending on the port, you can use the vertical auto-aim even with freelook; I know GZDoom allows it. But my point was that with freelook off but still using the mouse for turning (which is what the originator of that quote was), you still get the auto-aim too. Here we have an issue between wanting to emulate original walk and turn speeds (both for authentic feel and for enemy challenge/balancing that comes with it so it won't feel too easy for fast moving player) and yet not making the movement turtle-slow. I feel like walking through deep waters, don't say original game was different, I'm just not used to feel so slow inside pseudo-3D shooter. I think the best solution is to offer an option that toggles the limiting so the end-user can choose between authenticity and playability. Now *this* is how the DOS version should've ran from the very beginning! You'll notice that the framerate in the DOS version is capped at a fairly low number. Even on high-end machines, the game hacked around incessantly, making it harder to aim your fireballs at enemies from a distance. For this source port, I wrote the OpenGL-based rendering from scratch, which is why it doesn't suffer from the rendering quirks that were present in the DOS game. John Carmack once admitted that the polygon-based rendering in the Catacombs 3D engine is of poor quality. He really had quite a bit of difficulty in getting it as robust and reliable as it needed to be. That was one of the reasons why later on he decided to go for the more straightforward ray casting technique. Which resulted in a more efficient and robust engine for Wolfenstein 3D. 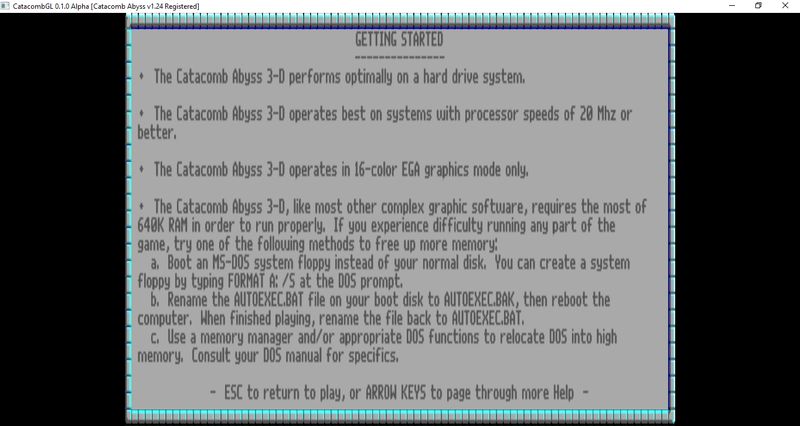 The DOS game just displays the contents of HELP.TXT on screen when F1 is pressed. It might give some useful hints, so if you're interested, you could open that file in a text editor. It is indeed remarkable how creative and unique some of the features in the game are, considering that it was released in the same year as Wolfenstein 3D, so at that time there were hardly any other FPS around to get inspiration from. Thanks for the offer, but at this moment I'm not really looking for artwork. My main focus for the coming time is to get support for the other games in, along with some additional improvements. Further along the line I might consider to add some modding possibilities, like new levels, textures and revised monsters. But I can't promise anything on that front, because of all the other things I have in mind. Agreed. With a source port like this, sacrificing some authenticity to improve playability cannot be avoided. For example, the gameplay was originally designed for a 320x200 resolution on a 14" CRT monitor with a poor framerate. Running the game in 1920x1080 on a decently sized modern monitor and a high framerate already gives the player an advantage that was not present in the DOS game. How much more authenticity a player is willing to sacrifice to improve playability can be highly subjective. There is no right or wrong there. Personally, I wouldn't increase the player speed myself. But I don't mind offering a customization option for that. I noticed that GZDoom has such an option, so apparently there was already a demand to have a customizable player speed in Doom. I don't mind the player's regular forward/backward speed at all, but I do find myself constantly craving a Run button. I never really liked the controls where running toggled on and off with a tap of a key rather than you holding the button down. That being said, I know it's a matter of personal preference. Just a small update on my progress. My plan is to incorporate support for the Catacomb Armageddon in the next release, along with the suggestions that were given in this thread. Since I have limited time to work on this source port, the next release will still take a few months to complete. 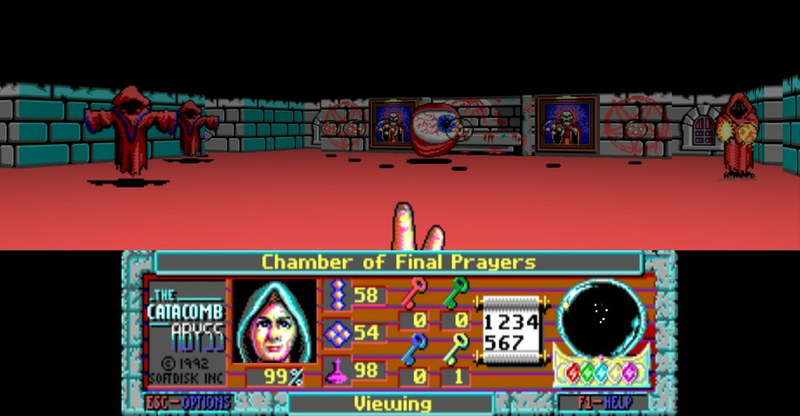 So far I managed to load the graphics, sounds and maps from the Catacomb Armageddon. I'm currently busy re-implementing the Armageddon monster behaviors, as they have to be accomodated to the higher framerate. Definitly a fun part to work on. 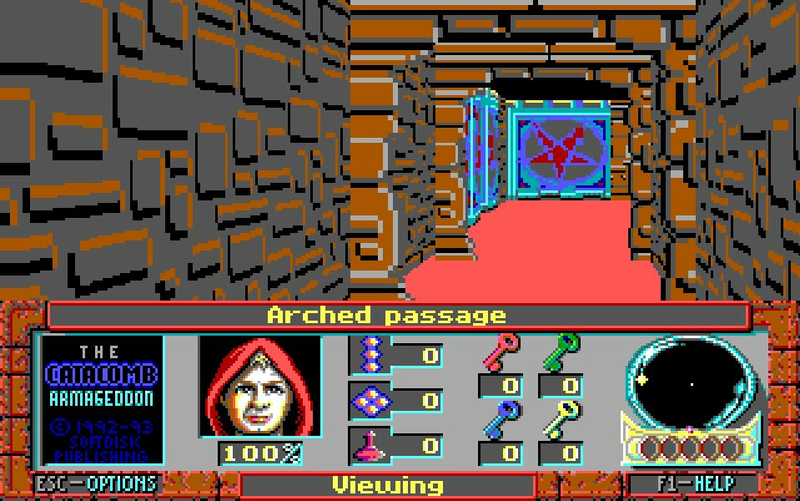 While attempting to recreate this arched passage, I was surprised to find out that the original DOS game accomplished this effect with simple sprites. So the arches are not really aligned with the surrounding walls; they rotate to follow the players viewpoint. Due to the tight corridor, this is hardly noticeable. That is interesting! 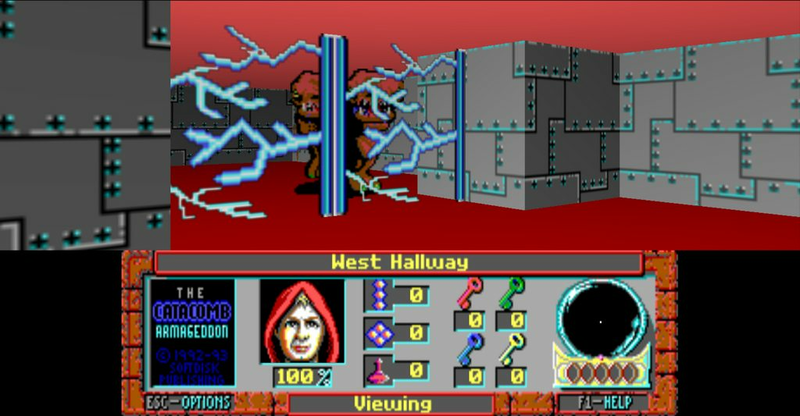 It does make sense, as things like the Wolf3D doors didn't exist in the Catacomb games. And that never occurred to me until you mentioned this. 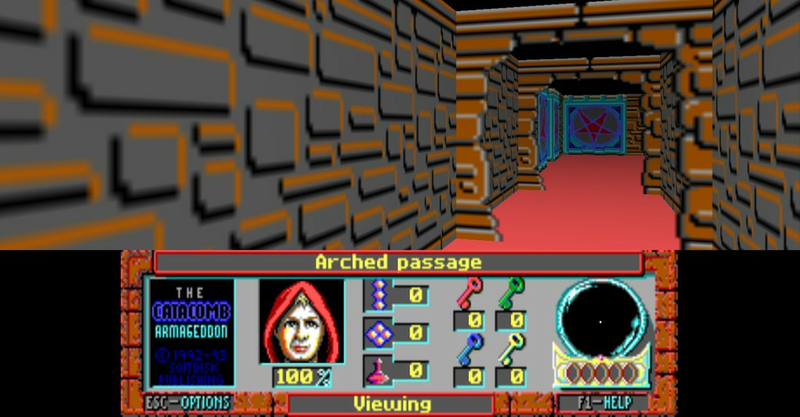 Correct, the Catacomb 3D engine didn't support Wolf3D style doorways. So that got me thinking: what about those forcefields in the Demons Hold level? Here's another update on my progress. I was actually inspired by gerolf, who made in another thread the valid remark that small updates are better than no updates. I got pretty much all gameplay mechanics in place for the Catacomb Armageddon. I still need to playtest it a lot, but a next release is getting near. In the mean time I'm also going through your feedback. Just now I got the in-game help (F1) working, as suggested by doomjedi. The help pages are content-wise identical to the original game, including tips on getting the most out of your 640K RAM. I've just released version 0.2.0 ! * Support for the Catacomb Armageddon! All levels and monsters are present. Requires the Catacombs Pack from GOG.com. * Game selection screen with the option to manually browse to a folder with game data. Suggested by Master O. * Support for x64 builds. Implemented by Arsen "Honeybunch" Tufankjian. * Support for full screen and borderless windowed mode. * In game help screens. Accessible via the F1 key. * Customizable player turn speed. Suggested by doomjedi. * Customizable player run button. By default, the run button is not bound to any key, since the original games did not support running. Suggested by doomjedi and Tricob. Enjoy! And as always, please let me know if you encounter any bugs or have some suggestions for improvements. Sounds like an excellent update! Crashed on my side, can't play. It recognizes only Abyss, and crashed there when "entering the cemetery"
I'm sorry that the new version didn't work as expected for you. Directly after "entering the cemetery", the 3D renderer should kick in. I've actually experienced a crash as well in this spot, on my Windows 10 laptop with Intel Integrated Graphics. I solved it by right-clicking CatacombGL.exe, selecting "Troubleshoot compatibility", and selecting "Run this program in compatibility mode for Windows 8". Maybe that helps. 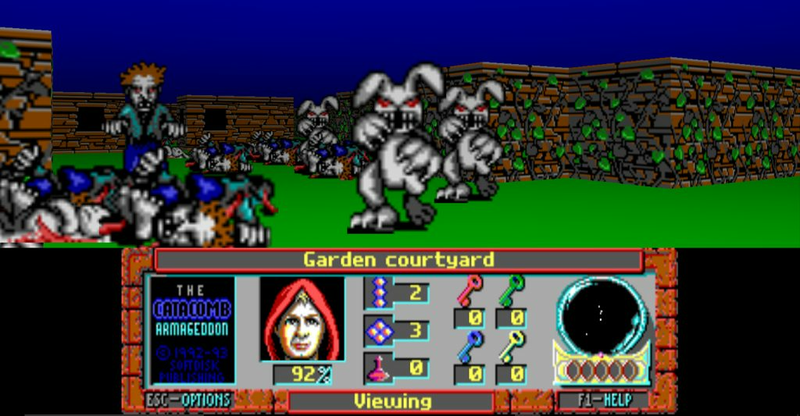 Assuming that you have the Catacombs Pack from GOG installed, it's strange that the Armageddon game files could not be detected. The program peeks in the Windows registry to find out in which folder it was installed. If that folder cannot be found, for example in case it was moved, you should be able to manually browse to the correct Catacombs Pack folder. With that said, I did just spot a small bug, based on your feedback. It seems the Armageddon game files are initially not detected when CatacombGL.exe is placed in the same folder as those game files. But for the time being it is possible to work around it by manually browsing to the parent "Catacombs Pack" folder. I will fix it, of course.